In winter, people might lessen their outdoor exercise. The days get dark earlier, and it can be very cold! These conditions can make it harder for some of us to get outdoors for exercise. However, cold days can be perfect for outdoor workouts! There are at least three important health benefits to cold-weather workouts. 1. The body works harder in cold weather. Health experts at the Medical University of South Carolina say the body must make extra energy to keep warm in low temperatures. This means the body is burning more calories and fat. Your lungs also may work better in cold weather. Researchers at Northern Arizona University in Flagstaff found some interesting results in a study of goats. But still, their results were pretty interesting. The scientists looked at how cold-weather activity affected goats. They found that “during the three coldest months, the sedentary but cold-exposed goats experienced a 34% increase in maximal oxygen uptake … and a 29% increase in running speed.” When temperatures increased in the spring both oxygen uptake and running speed of the goats decreased. 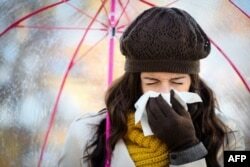 A strong immune system can help to protect you from colds and the flu. 2. Regular cold-weather exercising may help the immune system. The winter season is also cold and flu season. Making outdoor exercise a usual part of your workout may help you avoid both colds and the flu. It may strengthen your body’s defense system. The Mayo Foundation for Medical Education and Research found that winter workouts can cut your risk of getting the flu by 20 to 30 percent. 3. Exercising outdoors in cold weather may help your mental health. Some people who suffer from “winter blues” or Seasonal Affective Disorder, may benefit from going outside to exercise in the fresh air and sunshine. An outdoor workout increases exposure to sunlight. Sunlight helps the body produce vitamin D. And vitamin D produces hormones that brighten your mood. 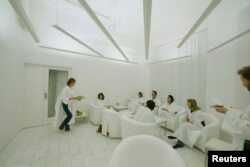 In Sweden, where lack of winter sunlight can contribute to depression, customers dressed in white robes take in simulated sunlight at Stockholm's Iglo Ljuscafe, Dec. 12, 2006. So, there are several health benefits of exercising outdoors in very cold weather. But there are also dangers. Frostbite is one of the most common. Edward Ward is a doctor at Rush University Medical Center. He explains how frostbite happens. "When the air temperature drops below zero especially factoring wind chill, things freeze. And that includes the fluids that's within your fingers or your toes, nose, ears, anything that's exposed to that wind chill can be affected by frostbite." Protecting your fingers, toes, ears and nose is very important. Cold winds affect these parts of the body more quickly than other parts. Christopher Sampson is a doctor with University of Missouri Health Care. He explains that frostbite can happen rapidly -- in less than 30 minutes. "With frostbite people can start experiencing symptoms pretty rapidly, on average with mild winds and cold temperatures it can occur in as less than 30 minutes, with extreme cases. When it's very, very cold and winds are very, very strong, sometimes frostbite can develop in as little as 5 minutes." But, frostbite can. It can even lead to loss of tissue and limbs. The most serious danger is hypothermia. Hypothermia is when the body temperature has fallen below 35 degrees Celsius or about 95 degrees Fahrenheit. This happens when your body can not produce enough energy to keep the body warm enough. Hypothermia can kill you. There are several signs to watch for before it is too late. However, Dr. Sampson says it is ice that creates the biggest risk for workouts outside when it is very cold. People don’t see the ice, step on it and fall. But if you are dressed right, you can exercise safely in low temperatures. Experts on several health websites say it is important to dress in layers. The layer closest to the body should be made of a material that takes moisture away from the body. The next layer should be a material that traps heat, such as wool. And finally, the outer layer should be water resistant. Of course, don't forget gloves, hat, good socks and shoes. When it is really cold, a scarf or face mask will protect your skin and lungs. 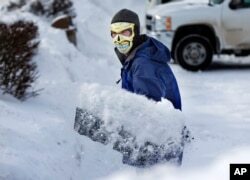 In Maine with the temperature at 3 degrees Fahrenheit, this man shovels snow wearing a face mask to guard against frostbite, January, 2014. Temperature is not the only things that will affect your outdoor workout. It is also important to consider wind and water. Wind can go through your clothing and steal the layer of warm air that surrounds your body. If you get wet, you may not be able to keep your body temperature high enough. So, if you are a generally healthy person, do not think you must move your workouts indoors in winter. As long as you dress properly, drink enough water and exercise safely, you can get a lot out of a cold-weather workout. Let us know your favorite type of exercise environment ... in the Comments Section! Anna Matteo wrote this story for VOA Learning English. Caty Weaver was the editor. prickle – v. to cause or experience an unpleasant feeling that is like the feeling of having many small, sharp points against your skin : prickling – n.
numb – adj. unable to feel anything in a particular part of your body because of cold, injury, etc. : numbness – n.
shiver – v. to shake slightly because you are cold, afraid, etc. Food Cravings: They're All in Your Brain.